Security Now! #101 with Steve Gibson and Leo Laporte covered the deceptively simple challenge of differentiating human from non-human automated clients (great podcast as always .. check it out). Commonly this is done with distorted text like the sample on the right. The Official CAPTCHA Site has a wealth of information about this field, including discussion of the relay attack that has the potential to defeat any "are you a human?" test (because it enrolls unwitting human accomplices to do the work). The coolest piece of work though is the reCAPTCHA project. This is a project of the School of Computer Science at Carnegie Mellon University, and it provides a public service for plugging-in a CAPTCHA to your site. But unlike other systems that are just wasting 10 seconds of your time, this system is actually digitizing public domain archives at the same time (getting you to fix the translation of words that have defied the best OCR software)! Perl is one language that you can easily use reCAPTCHA with, using Andy Armstrong's Captcha::reCAPTCHA module. 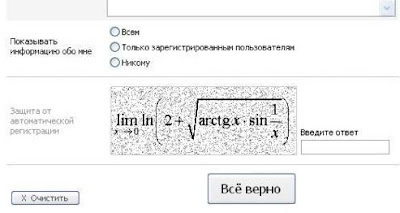 But I'm afraid the humour archive has the best captcha ever ..